Tommy Wright was grateful that Corby Town got another opportunity to progress in the FA Cup. 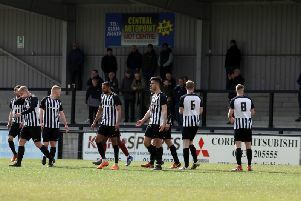 The out-of-form Steelmen were staring down the barrel of a second qualifying round exit at Steel Park on Saturday when Luke Benbow gave Evo-Stik Northern League Premier Division side Rushall Olympic a second-half lead. But a Gavin Caines own-goal rescued Wright’s men and means they will now travel to the West Midlands for the replay tomorrow (Tuesday) night. The Steelmen are now without a win in eight matches in all competitions. And Wright said: “We have got another chance and I am grateful for that because it could have been a lot worse. “They went 1-0 up and I am sure they will be feeling a little bit hard done by because we have got a goal thanks to their lad slicing it into his own net. Wright also revealed his plans for the tie were hit when an error in paperwork prevented Leicester City loan duo Cedric Kipre and Aaron Hassell from playing. It also means they won’t be available for the replay. “It was frustrating because at 8pm on Friday our plans were changed due to the error in paperwork that should have been sent off,” the Steelmen boss added. “Cedric and Aaron would have been involved and, with Greg Mills and Anton Brown already being out, it meant I was missing four players.